NOTE: This is an excerpt from a recent, 43-page report on Carl's experiences while attending a "world government" meeting. The full report, which is completely documented, includes major points from this organization's five-year action strategy, it's historical background and links to the United Nations, and its many successes – especially the International Criminal Court. To access the entire report, go to www.forcingchange.org and become a member. Your subscription/membership does two things: 1) It empowers you with specialized information to better understand our worldview challenges; 2) It allows the research work of Carl Teichrib to continue. Final point: Complete endnotes are found in the original Forcing Change report. Winnipeg, Manitoba - also known as "Winter-peg" - is jokingly described as a place with two distinct seasons: 13 months of winter, and six weeks of mosquitoes. As a Manitoba resident myself, I understand the sentiment behind this exaggerated description. Winnipeg, as nice as it can be in our short summer, is not known as an international destination. But this year my provincial capital joined a prestigious list of prominent world-cities; Geneva, London, Oslo, Rome, The Hague, Washington D.C., Brussels, San Francisco, New Delhi, Copenhagen, and Tokyo. Each of these locations, and now Winnipeg, have been ground-zero for an important "world government" meeting. From July 9-13, 2012, the University of Winnipeg hosted a globally-significant group of people. Delegates streamed in from around the planet, coming to debate and pass resolutions, vote-in new council members, and develop campaigns to further global governance. This was the 26th International Congress of the World Federalist Movement (WFM), the largest membership-based organization specifically designed to advance the idea of world government. And I, along with a partner, attended this important event. The "World Federalist Movement" isn't exactly a household name. Even among the research community critical of internationalism, it seems little serious attention has been paid to this group. Books have been written exposing the one-world designs of the United Nations, the power of the global banking community, the influence of the Council on Foreign Relations, the secretive Bilderberg gatherings, and the high-strangeness of the mysterious Order of the Skull and Bones. But the World Federalist community? Besides a few passing mentions in the exposé literature, those who monitor global governance have largely overlooked the WFM. Ironically, it's not easy finding a detailed, published history from the perspective of the Movement itself. Much has been written endorsing or advancing the concept of world federalism, and a few first-hand accounts have surfaced, providing an important if fragmented personal perspective. Cord Meyer's book, Facing Reality: From World Federalism to the CIA, is one first-person example; Meyer was a United States special assistant to the United Nations Charter Conference in 1945, became the first president of the United World Federalists, and then joined the Central Intelligence Agency where he eventually held the position of Assistant Deputy Director of Plans (second in command of global clandestine operations). But the only in-depth, published account of the World Federalist community that I have found is Joseph P. Baratta's two-volume survey titled The Politics of World Federation - originally priced at $150! Although the World Federalist community appears low profile today, it has played an indelible role in the quest for world government. I witnessed this in a most unusual manner in 1999 while attending a national World Federalist event in Dallas, TX. There, somebody had set-up a television and VCR in the hallway, and at one point in the day I found myself seated with Federalists watching tapes of Cliff Kincaid and Phyllis Schlafly, two authors who write and speak on the dangers of global governance. 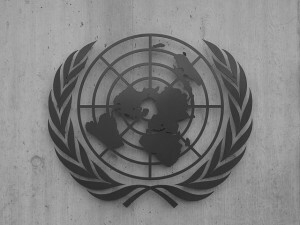 Neither individual mentioned the World Federalists by name, but both detailed aspects of the United Nations empowerment agenda, and one of them framed this as a back-door approach to world government. Immediately, a boisterous World Federalist standing behind me shouted, "That's us. We're the conspiracy!" There is a paradox in this boast. If it is a conspiracy, World Federalists represent the "conspiracy of an idea" versus a secretly guarded, closed-loop system. Why? Because World Federalist organizations operate on a membership model, drawing funds and political leverage from their numbers. In other words, it's a relatively transparent operation; tax returns are filed, director names are listed, campaigns are public, motives are discernible. H.G. Wells would have referred to this as part of "an Open Conspiracy" - a religious-like, "creative organizing movement" of various and enlightened groups who are loyal to world organization, exerting their worldview through education and propaganda. Wells, who was a long time promoter of world government and global technical management, conceived of a world-order revolution taking place through organizational stages, from small groups advancing to complex organizations, and centralizing as like minded bodies assimilate - finally, "attempting to swallow up the entire population of the world and become the new human community." Something to ponder: In considering a systemic world change, as envisioned by a dedicated group, is it possible that an "open approach" may be more fruitful than a closed operation? Granted, organizations using a secretive or semi-closed approach would celebrate victories, especially in the influencing of national elites. However, closed organizations run the risk of eventually arousing public suspicion, mistrust, or push-back. On the other hand, an "open group" may successfully function for decades - permeating governmental, academic, and social strata - without experiencing significant public discord; because it is open, it is accessible, it is democratic, and therefore non-threatening. Globalist organizations using this "open" methodology act as a repository for world order ideas, and as society shifts, the group presents issue-specific campaigns to meet the demand for change, with an eye remaining on the bigger prize. In many ways the World Federalist Movement fits this description. Today it is virtually unknown by the general population, yet the Movement celebrated its 65th anniversary this year. In those decades, the WFM has been a primary actor in openly framing global agendas, while remaining structurally unscathed when a campaign experiences a public-relations setback. Furthermore, its openness lends authenticity, generating support and endorsement from peers, and allowing other groups to network within its more narrow campaign programs. This dynamic was observable at the Winnipeg WFM Congress as letters of congratulations came from UN Secretary-General Ban Ki-moon and former UN leader Kofi Annan. "Your Movement has a crucial role to play in helping the United Nations and people everywhere to build the future we want... we in the United Nations know we can succeed only when we work with our partners in common cause. That is why we attach great importance to our constructive engagement with the World Federalist Movement, and it is why we look forward to many more years of cooperation." "I send my special greetings to your President, Lloyd Axworthy, and General Secretary, Bill Pace who, together with hundreds of civil society actors, supported the establishment of the International Criminal Court and the adoption of the Responsibility to Protect norm. These are just two of the many ways your Movement has worked to advance peace and security, the rule of law and human rights. I wish you all every continued success in your important work." Success they have had (See "Stepping Stones to Global Order" on page 31 of the July edition of Forcing Change), and the WFM is presently gearing up to re-energize old campaigns and advance new ones. But before we examine the outcome of the 26th WFM Congress, we need to briefly dive into the history of this Movement. Why? Because the World Federalist community, arguably more than any other group, frames the back-story to the biggest of ideas: world government. To read the full report, go to www.forcingchange.org and sign-up for a subscription/membership. Members have access to the latest edition, all back-issues, and a host of reports and other resources.